According to the statistics from a third-party platform, among all the Chinese activities in the Bay Area in 2018, University of San Jose ranked third place in the organizers of Chinese activities in the Bay Area. USJ had a foothold on public activities in silicon valley and served to develop global innovation. 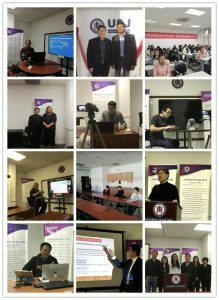 It has held a series of “USJ Silicon Valley Mini-Sharing Session For Career Development” (45 sessions) \ “USJ Open Class Series” (50 session) \ “USJ Silicon Valley Cloud Lecture” (30 sessions) \ “Conference of USJ and Chengdu Talent Association” (10 sessions) \ “1st Token Economy Forum”, etc, all the events and activities have aroused good response in the industry. Your continued attention and support to USJ is highly appreciated. In 2019, we will continue to work hard to bring more exciting activities and events, with our actions to thank every friend who supports and helps us. In 2019, more surprises and excitement are at the University of San Jose!